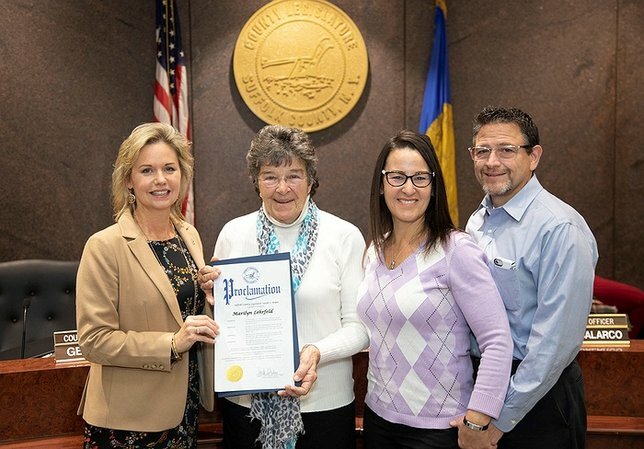 Suffolk County Legislator Sarah Anker presents a proclamation to the Long Island Ladies Trapshooting Champion, Marilyn Lehrfeld, who was joined by her daughter and son-in-law. Hauppauge, NY - November 29, 2018 - On Tuesday, November 20th, Suffolk County Legislator Sarah Anker presented Marilyn Lehrfeld with a proclamation for being named the Long Island Ladies Trapshooting Champion. A teacher by profession, Marilyn focused on working with speech and hearing handicapped children and donated her time to various speech and hearing organizations to better serve her students. She also prioritized the safety and well-being of her community, and has served as a volunteer with the American Red Cross, the American Heart Association, and is a certified EMT and water safety instructor. Lehrfeld is involved in the Peconic River Sportsman Club, where she has excelled and earned the title of the Long Island Ladies Trapshooting Champion and is on the 2019 Trapshooting All American Team. Subject: LongIsland.com - Your Name sent you Article details of "Legislator Anker Honors Long Island Ladies Trapshooting Champion"